Fig. 5-3. Use of Celestial Sphere to Represent Direction of Objects In Space. The sides of the triangle are arc lengths. The angles of the triangle are rotation angles. Points on the celestial sphere represent directions in space, such as the direction to the Sun, the Moon, or a spacecraft axis. The direction opposite a given direction is called the antipode, cm- antipoint, and frequently has a "-1" superscript. Thus, S-1 is the direction opposite the Sun, and is called the antisolar point. Nadir is the direction to the center of the Earth. The direction opposite nadir is called the zenith. Points on the sphere may represent either directions to real objects or simply directions in space with no object associated with them, such as the direction parallel to the axis of the Earth (the celestial pole) or parallel to the +Z-axis of a spacecraft coordinate system. A great circle on the celestial sphere is any circle which divides the sphere into two equal hemispheres, Any other circle on the sphere is called a small circle. Any part of a great circle is called an arc or arc segment and is equivalent to a straight line segment in plane geometry. Thus, the shortest path connecting two stars on the celestial sphere is die great circle arc connecting the stars. Two points which are not antipoints of each other determine a unique great circle arc on the celestial sphere. Fig. 5-4. Distinction between Arc Length and Rotation Angle Measurements. Moon, and Sun on the spacecraft sky. The arc length between the Sun and the Moon is the angular separation between them as measured by the observer. 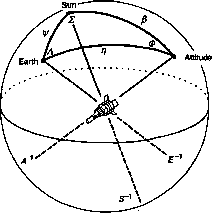 The rotation angle about the Earth between the Sun and the Moon is equal to the angle between 2 planes. The observer, Earth, and Sun form the first plane, and the observer, Earth, and Moon form the second. 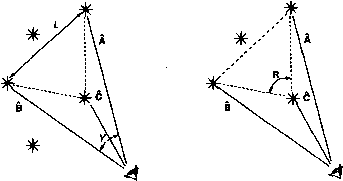 Both types of angles are important in mission geometry problems, and we must clearly understand the distinction between them. Table 5-2 lists the properties of these two basic measurement types. As shown in Fig. 5-5, the +X-axis is normally toward the reference point on the equator, and the +Z-axis is toward the positive or North Pole. The great circles through the poles and perpendicular to the equator are called meridians. 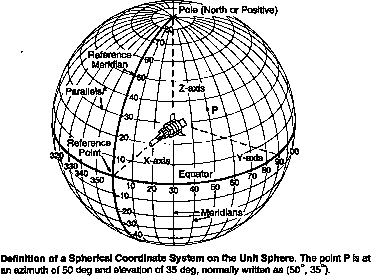 The meridian through any point on the sphere determines the azimuth coordinate of that point Azimuth is the equivalent of longitude on the Earth's surface, and is measured along the equator. The azimuth is also equivalent to the rotation angle measured counterclockwise about the pole from the reference point to the point in question. 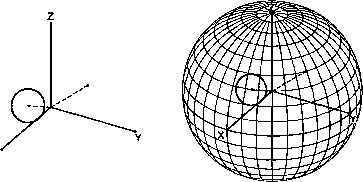 The second coordinate which determines the position of any point on the sphere is the elevation or latitude component It is the arc-length distance above or below the equator. The co-latitude or co-elevation is the arc length from the pole to the point in question. Small circles at a constant elevation are called parallels. Because a parallel of constant elevation is not a great circle (except at the equator), the arc length along a parallel will not be the same as the arc-length separation between two points. As Table 5-3 shows, several spherical coordinate systems in common use have special names for the azimuth and elevation coordinates. TABLE 5-2. Properties of Arc Length and Rotation Angle Measurements. "Angle from A to B" or 'Arc length between A and B"
"Rotation angle from A to B about C"
TABLE 5-3. Coordinate Names in Common Spherical Systems. * Also used are zenith angle = angle from (Mint directly overhead to point In question = 90 deg minus elevation angle; and nadir angle = angle at the observer from the center of Earth to (Mint in question = 90 deg plus elevation angle. where atan2 is the software function with output defined over 0 deg to 360 deg and the as in function is evaluated over -90 deg to +90 deg. 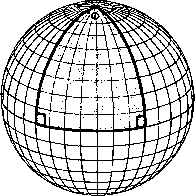 Another concept in spherical geometry that is different than plane geometry is illustrated in Fig. 5-6, in which we have constructed a spherical triangle using the equator and two lines of longitude. The intersection of the longitude lines with the equator are both right angles, such that the sum of the angles of the triangle exceed 180 deg by an amount equal to the angle at the pole. The sum of the angles of any spherical triangle is always larger than 180 deg. The amount by which this sum exceeds 180 deg is called the spherical excess and is directly proportional to the area of the spherical triangle. Thus, small triangles on the sphere have a spherical excess near zero, and are very similar to plane triangles. Large spherical triangles, however, are very different as in Fig. 5-6 with 2 right angles. where n is the number of sides, and £is the sum of the rotation angles expressed in radians. Fig. 5-6. The Sum of the Angles In a Spherical Triangle is Always Great«' than 180 deg. The amount by which the sum exceeds 180 deg Is called the spherical excess and Is proportional to the triangle area. Figure 5-7 shows a variety of spherical triangles. Note that all of the triangle sides are great circle arcs. Figure 5-7A is a nearly plane triangle, for which the sum of the angles is approximately 180 deg and plane geometry is a close approximation. Figure 5-7B is called a right spherical triangle because the angle at B is a right angle. Just as plane right triangles have particularly simple relationships among the angles and sides, right spherical triangles also have exceptionally simple relationships between the sides and angles. These are expressed by Napier's rules which are written out in Appendix D. Right spherical triangles are common in mission geometry problems, and provide simple, straightforward solutions for many problems associated with angular measurements. There is a second type of special and particularly simple spherical triangle shown in Fig. 5-7C. Here, side A-B has an arc length of 90 deg. This is called a quadrantal spherical triangle. An equally simple set of rules apply to the relationship among the angles and sides in quadrantal spherical triangles. These are also summarized in Appendix D. Between them, right and quadrantal spherical triangles provide solutions to most problems encountered in mission analysis. Figure 5-7D shows an obtuse isosceles triangle with two equal rotation angles larger than 90 deg. Clearly, this cannot exist in plane geometry. A similar strange triangle for plane geometry is Fig. 5-7E which shows an equilateral right triangle in which all three angles and all three sides are 90 deg. This triangle represents 1/8 of the surface of the celestial sphere, and has an area of 0.5n steradians, which can be seen either by examination or from the spherical excess rule. Finally, Fig. 5-7F shows a very large spherical triangle. Note that this triangle is remarkably similar in appearance to the small triangle in 5-7 A. This is because the triangle can be thought of either as a small triangle with three angles of approximately 60 deg, or as a very large one, with three angles of approximately 120 deg. That is, the area between A, B, and C can be thought of either as the inside of a small triangle or as the outside of a large one which covers all of the surface of the sphere except for the small area between A, B, and C. In this large spherical triangle, die rules of spherical geometry still apply and can be used in very convenient fashions as described further in Wertz . D. Obtuse Isosceles Triangle E. Equilateral Right Triangle F. Very Large Spherical Triangle Fig. 5-7. 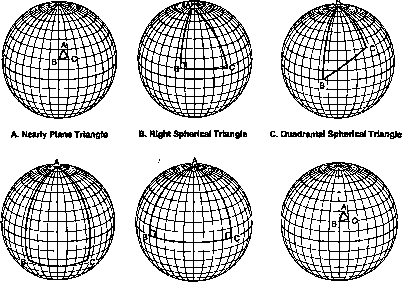 Types of Spherical Triangles. See text for discussion. In plane geometry, we can make triangles larger or smaller and maintain the same relative proportions. In spherical geometry, this is not the case. A spherical triangle is uniquely specified by either 3 sides or 3 rotation angles. 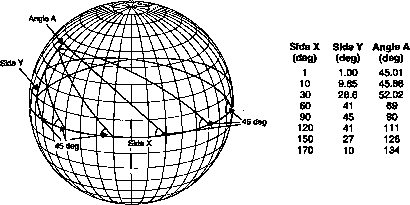 Additional details on elementary spherical geometry are in Appendix D, which includes references to several standard books. Because spherical triangles approach plane triangles in the limit of small size and because most analysts are much more familiar with plane geometry, they tend to use plane geometry approximations even when it is entirely inappropriate. An example would be a geometry problem dealing with the surface of the Earth as seen from nearby space. Figure 5-8 shows the differences between plane geometry and spherical geometry, using the example of a right spherical triangle with one 45-deg rotation angle. Here both the length of the hypotenuse and the other rotation angle are a function of the size of the triangle. For a spacecraft in geosynchronous orbit, the apparent Earth radius is 8.7 deg and, from the figure, the differences between plane and spherical geometry will be of the order of 0.1 deg. If this amount does not matter for a particular problem, then the plane geometry approximation is fine. Otherwise, we should use spherical geometry. In low-Earth orbit, the angular radius of the Earth is 60 deg to 70 deg, so plane geometry techniques give not only incorrect numerical answers but results which are conceptually wrong. 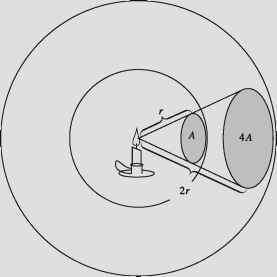 Thus, we should avoid plane geometry approximations for problems involving spacecraft in low-Earth orbits or nearly any type of precision pointing. Fig. 5-8. Succession of Right Spherical Triangles with One 45 deg Rotation Angle. As spherical triangles become larger, they become less and less similar to plane triangles. In the plane geometry approximation y = x and A = 45 deg. On the sphere tan y = sin xtan 45 deg and cos A = cos xsin 45 deg. face and the Sun. We can use the latter either to calculate Sun interference or for thermal analysis. In both cases, once we choose the correct coordinate system, we can easily develop exact formulas using spherical techniques. The first example is a satellite in a circular low-Earth orbit at altitude H = 1,000 km and inclination i = 32 deg. We wish to determine the eclipse fraction for any date and also the maximum and minimum eclipses over a year. Figure 5-9 shows four different views of the geometry of this problem. In Fig. 5-9A we have drawn the geometry in the "normal" fashion, with a Cartesian coordinate system centered on the Earth and vectors to the spacecraft and to the direction of the Sun. Although we could apply this coordinate representation to our problem, it gives us no particular insight Also, to use this coordinate representation without further analysis, we would have to simulate the orbit and do a large number of trials to sample various eclipse durations throughout the year. Fig. 5-9. Alternative View of Satellite Geometry for a 1,000-km, 32-deg Inclination Orbit we have gained some additional insight from this figure, it would still be awkward to compute the eclipse duration for any particular geometry. Figure 5-9C illustrates the same geometry in a celestial coordinate system centered on the spacecraft, in which the orbit plane is the equator and we hold the direction to the Earth fixed along the +X-axis. In this coordinate frame the Earth's disk is the fixed shaded circle. Because one axis is always facing the Earth, this coordinate frame rotates once per orbit in inertial space about the orbit pole. 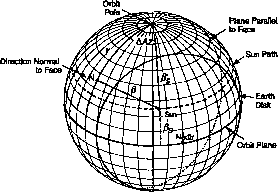 Thus any objects approximately fixed in inertial space, such as the stare, Sun, or Moon, will appear to rotate once per orbit about the orbit pole. The heavy, solid line shows a typical path of the Sun in one orbit Again, an eclipse will occur whenever the path of the Sun goes behind the disk of the Earth. We now have enough insight to understand what is happening throughout the year and to develop straightforward formulas for the eclipse fraction under any conditions. In any one orbit, the Sun will move along a small circle path and the duration of the eclipse will be the fraction of the small circle behind the disk of the Earth. For the orbit illustrated, the eclipse covers 113 deg of azimuth. Thus, the eclipse will last for 113 deg/360 deg = 32% of the orbit period or about 33 min for the 105 min, 1,000 km orbit [see Eq. (7-7) for the orbit period]. As the Sun moves along the ecliptic throughout the year, it will move slowly up and down on the globe plot The angle of the Sun above or below the orbit plane, goes from a maximum of 55 deg above the orbit plane to 55 deg below the plane. (55 deg is the sum of the assumed inclination of 32 deg and the angle between the ecliptic and the Earth's equator of 23 deg). By inspection, the maximum eclipse occurs when the Sun is in the orbit plane. It covers 120 deg of azimuth or 35 min for this orbit Again by inspection, we see that the minimum eclipse occurs when the Sun is at the upper or lower limit of its range. It covers approximately 60 deg of azimuth. Thus an eclipse will occur on every orbit, with a minimum eclipse duration of about half the maximum, or 17 min. However, we can also see by inspection that eclipses near minimum duration will occur only when the Sun is quite close to its extreme range limit Most of the time, the eclipse duration will be close to the maximum. Consequently, if we wish to assume an average eclipse for analysis purposes, we should take a value close to the maximum eclipse rather than one midway between die maximum and minimum values. For our example, p = 60 deg, ¡3$ has been chosen to be 25 deg, and, therefore, <t>= 113 deg and 7g = 33 min as expected. Eq. (5-4) provides the eclipse fraction for any Sun geometry involving circular orbits and an approximate check for orbits which are not precisely circular. By adjusting p appropriately, we can use the same equation to determine the time the Sun will be a certain number of degrees above or below the Earth's horizon. This example shows how we develop physical insight and simple formulas by using global geometry to analyze mission geometry problems. We can extend the straightforward computations of the preceding example to determine the angle of the Sun relative to any arbitrary face on the spacecraft as the spacecraft goes around in its orbit This helps us analyze thermal effects and assess possible Sun interference in the fields of view of various instruments. Fig. 5-10. Geometry for Computation of Sun Angle on an Arbitrary Spacecraft Face. N is the unit vector or direction normal to the face. As the spacecraft moves in its orbit, the apparent position of the Sun moves along the dashed line and the arc length /} between the Sun and the normal to the face undergoes a sinusoidal oscillation. The problem now reduces to determining whether conditions (A) or (B) or both will occur and the relative order of the azimuth limits. As an example, consider Figs. 5-9 and 5-10, for which p = 60 deg, (O = 0.0010 rad/sec, and Ps=25 deg. We assume the spacecraft face has an area of 0.5 m2 with its normal vector at an azimuth of-75 deg from nadir (Azq = 75 deg) and an élévation of 35 deg above the orbit plane (y= 55 deg). From Eqs. (5-8) and (5-9), the azimuth limits are: eclipse = 18.5 deg, Az^^ = 131.5 deg, Azlback = 109.0 deg, and Az^j. = 251.0 deg. Therefore, the total energy input on the face F over one orbit is between the azimuths of Az, = 251.0 deg and Az^ = 18 J deg. which gives the same result as using Eq. (5-5) diiecdy. The nadir-oriented satellite above is spinning at one rotation per orbit in inertiai space. Thns, all of the above formulas can be applied to spinning spacecraft with the interpretation that Img is the average solar radiation input over one spin period, y is the angle from the spin axis to the face in question, and Ps'is the angle from the spin axis to the Sun. where F0 is the noneclipse value of F determined from Eqs. (5-12) or (5-13) and (Pis the eclipse fraction from Eq. (5-4). For Earth-oriented spacecraft the situation is more complex, because the solar input depends on the orientation of the Sim relative to both the Earth and spacecraft face being evaluated. Let 77 be the angular distance from ft to nadir and p be the angular radius of the Earth. If the face in question is sufficiendy near zenith (opposite the direction to the center of the Earth) that tf-p > 90 deg, then F = Fq and F will not be reduced by eclipses. For this condition, any eclipses which occur will happen when the face is shaded. Alternatively, consider what happens when |y- Pg' I -90 deg. In this case, there is only a small portion of the orbit when the Sun shines on the face. Let <P be the eclipse fraction from Eq. (5-4) and (Pgg the azimuth defined above at which the transition from sunlight to shade occurs. If Q/2 > the larger of |Azw ± $go|, then the spacecraft will be in eclipse when the Sun is in a position to shine on the face. In this case F will be reduced to 0. For conditions in between these two extremes, F will be between 0 and its non-eclipse value. Specific values will need to be evaluated numerically using Eqs. (5-4) and (5-8). Section 11.5 provides additional details on how to compute thermal inputs to the spacecraft.